For whatever reason, there’s been chatter circulating for years now about Dell being interested in (or journalistically prodded to be so) buying up Palm, Inc. Ever since the January unveiling of the Palm Pre that chatter has periodically ebbed and flowed more loudly than usual, but still with little basis for the argument, save Dell’s supposedly secret and floundering desire to get into the lucrative smartphone game. Dell is built on the idea that a computer is a commodity. Up until only recently, it was the most efficient packager of Intel chips and Microsoft operating systems and the most effective distributor of these devices to big companies. The opposite of Dell’s model, of course, is that of Apple and Palm. Apple often describes itself as a software company that makes its own hardware in order to control the environment on which its software runs. It serves a smaller, but more lucrative market of customers who want something distinct from commodity software on commodity platforms. Palm is taking the same approach with its Pre smartphone and WebOS software. Dell’s business model would have to change and adapt for something like a Palm takeover. For an example of how well a giant commodity corporation can handle something “different” while still juggling their juggernaut business you needn’t look any further than General Motors and their Saturn brand. GM was the Dell of the automotive world, but tried to make Saturn “a different kind of car company,” and while Saturns were arguably not bad vehicles, GM didn’t understand how to handle a different company like Saturn, even one that was of their own creation. This is not to say that Dell is mismanaging their business as poorly as GM, though they did fail to anticipate the fashion-ization of the personal computer that Apple kicked into gear a few years ago and other PC makers, like current market leader HP, caught onto quickly enough to steal a significant slice of Dell's market share. Dell is struggling to regain their dominant market position with products like the ultra-light premium Adamo laptop, but like HP’s computers they are very much defined by their commodity hardware and Microsoft operating system. And then there are the financial hurdles to taking over Palm. Despite being a lucrative investment given the relatively new state of the Pre and webOS, the cost to purchase Palm could be a complete loss (save for the expertise of its employees) should webOS fail to gain traction. As much as we hate to think it, that is a distinct possibility. At the same time, the cost to purchase Palm is increasing on a near daily basis, with the stock price smashing through the $14 mark last week, giving Palm a market value of just over $2 billion (a marked improvement over their pre-Pre December 2008 low of $157 million). If there was any time to stage a takeover of Palm, it was several months ago before the enormous rally in the stock price. At that, the average takeover pays a premium of close to 25%, and a hot company like Palm would likely demand even more cash to be considered as a suitor. On June 10, 2009, Dell sold new debt bonds to raise $1 billion in fresh cash, bringing their total cash-on-hand to $9 billion, likely enough to purchase Palm three times over. 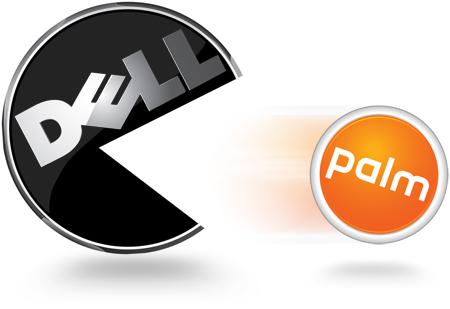 Dell has publicly spoken on their intent to purchase other companies outside the consumer PC world in a bid to expand their addressable market, but as The Wall Street Journal noted, Dell’s primary ambitions are in the data-storage and tech-services area, which certainly does not point in the same direction as Palm. Dell has bigger problems to contend with than their seemingly misguided smartphone ambitions. In the first quarter of this year, Dell’s revenues declined 23% and their profits dropped a painful 63%. Unlike the other big players in the PC market, Dell is relatively young blood and doesn’t have the same experience buying and integrating other companies into their fold. In the past six years, Dell has made just ten acquisitions, while IBM made 42 and HP purchased a staggering 72 companies (that’s close to one every month). Palm, on the other hand, likely would not be warm to any takeover overtures. With as hot a property as the Pre has turned out to be, Palm is banking on gaining a significant position in the smartphone marketplace. They’ve had their share of experience working under corporate owners U.S. Robotics and 3Com. Though we do have to thank the takeover by 3Com for the creation of the Treo smartphone (the senior management of Palm left after the takeover in 2000 and formed Handspring, created the Treo, and then was bought by a now-independent Palm three years later), by-and-large takeovers and acquisitions and inter-corporation dealings have been nothing but pain for Palm. Just look at the whole debacle surrounding PalmSource and PalmOne for reasoning why small companies shouldn’t act like big ones. Palm also has significant investment responsibilities to the Elevation Partners firm, who have dropped $425 million into the company to help finance the turn-around that brought us Jon Rubinstein as Chairman (and now CEO), webOS, and the Pre. Palm isn’t exactly rolling in cash, as of the last quarter they had $219 million in the bank and were burning through dough at a rate of $30 million a month, and that has likely increased significantly with the cost to actually launch the Pre. As they say, you’ve got to spend money to make money. Elevation Partners isn’t in Palm for a quick buck, though their estimated 33% share in Palm is now worth double what they’ve paid into it. With recently departed Palm CEO Ed Colligan soon joining their ranks, Elevation Partners looks to be in the Palm game for the long haul. So that leaves us with looking for a proper suitor for Palm. The only company with the correct mindset and deep pockets is, of all companies, Apple. As of last check, Apple had over $29 billion cash in the bank, and their product development and design mentality seems to be very similar to that of the newly reborn Palm. But with ex-iPod chief Jon Rubinstein at the head of Palm and numerous former Apple employees working high up in the ranks of Palm (many poached by Rubinstein himself), and Apple still riding high on the success of its iPhone line - a significant source of that $29 billion cash pile - they're probably more interested in crushing Palm than buying it. Thankfully, with the potential for enormous expansion of the smartphone market in the next few years, it would be very hard for Apple, Nokia, RIM, or any company to crush Palm. Any undoing of Palm and webOS will be by Palm's own doing, and so long as they continue along the path we're on now, that's not looking likely.